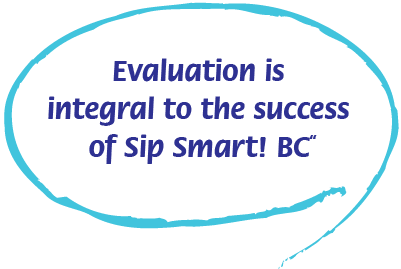 Evaluation is an important part of the success of Sip Smart! BC™. Throughout the development year, teachers, students and experts were consulted on an ongoing basis, and their feedback was incorporated into the evolving program. Search Promising Practices for Sip Smart! BC™ on the Canadian Public Health Agency of Canada (PHAC) website or click to link directly to the Sip Smart! BC™ Promising Practice entry. In Fall 2008, grade 4 students in 20 schools across BC were involved in a study conducted by the Social Research and Development Corporation (SRDC) to see if Sip Smart! BC™ made a difference in students’ sugary drink consumption, types of drinks chosen, and knowledge and preferences for different drinks. For highlights of the study, click here. To read the summary of the SRDC report, click here. Data was collected from May to June 2010 from the Sip Smart! BC™ Project Manager, Action Schools! BC, community dietitians, teachers and 198 Grade 5 and 6 students. The aim of the evaluation by the Social Research and Development Corporation (SRDC) was to gain a clear understanding of how the Teacher Resource was implemented, delivered, and promoted to teachers in BC schools. In 2010, the Heart and Stroke Foundation of Québec (HSFQ) secured funding to contextualize Sip Smart! BC™ to Québec and began adapting the program, and renamed it simply “Sip Smart!™” (Sois futé, bois santé! in French). The Public Health Agency of Canada (PHAC) selected Sip Smart! BC™ to be a case study highlighting the role of evaluation impact in both programs. Please click to download the case study in English and click to download the case study in French.